Banding today turned up some fun birds. I felt vindicated when I heard over the radio that this guy had been caught in the nets. I had caught a glimpse of what I was sure was an Orchard Oriole a couple of days ago. 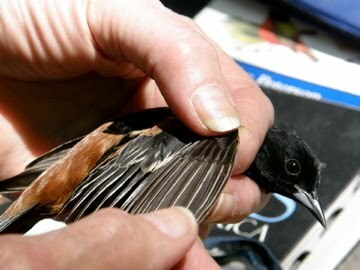 The banders caught and banded a female Orchard Oriole yesterday so it looks like we have a pair of birds on site. Here's the photos. In this shot the lead bander is checking out the wing. You have to look at various parts of the body to tell how old the bird is. The deep black color of the tail tells us this bird is "after second year" or in non-bander lingo, he was born more than two springs ago. Orchard orioles are very pretty but don't get much attention since their cousin the Baltimore Oriole is so much brighter. Still a handsome bird though. In this shot the bander is putting the band around the birds foot. The tool has special holes in the jaws so that the band can be attached firmly but at he same time not crush the bird's fragile leg. If you look closely you can see the band in the tool. That's all for now, more migrants on the way though! I agree, orchard orioles are gorgeous birds. Last year about this time, my brother-in-law had two orchard orioles visiting his hummingbird feeder. Since the feeder was located a foot from his family room window, it was very easy to get good looks at these birds from just a few feet away. Beautiful bird! Lovely photos of this experience. I have never watched a bird banding before. The detail you get to see is amazing. Thanks for the comments Gordon and Debbie. Debbie, I hope you get to see bird banding some time. It is very interesting. Check around at local nature centers. There are bird banders across the country and many nature centers use bird banding as a regular part of their educational programming.